Q: Dear Miss Breed's story happened more than 60 years ago but feels particularly relevant in our current political climate. For the young people who read your book today - what is the message of Miss Breed ? I began working on this story before 9/11. But almost at once the front page stories of war time hysteria and attacks on Muslim Americans had a frightfully familiar sound. In 1941 there were rumors of enemy air raids, of saboteurs who would send signals to enemy ships and poison the water supply. Civilians were urged to stock up on emergency supplies. During the first week of the war, New York's Mayor LaGuardia warned that it was no longer a question of "if" bombs would fall on the west coast, but only "when". In 2001 the sound of a plane overhead was cause for alarm. Our leaders spoke of not "if" but "when" further attacks would come and families were buying up duct tape to seal their windows against chemical warfare. Those who lived through the incarceration of more than 120,000 men, women, and children of Japanese ancestry, are well aware of the dangers of racial profiling and wartime hysteria, when civil liberties are brushed aside and the Constitution is treated as a just piece of paper that could be forgotten. I was not trying to write a message but I think it is there. It is often said that those who forget their past are destined to repeat it. I asked all of the people I interviewed what they would want young people of today to know about that time and the answer they gave in one form or another was.it must never happen again. Q: What inspired you to write Dear Miss Breed? I found Clara Breed by accident on the internet! 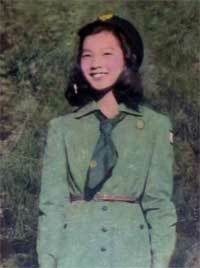 I was looking for a Japanese American childhood classmate whom I had not seen for more than fifty years. Thanks to Google, I found myself on the site of the Japanese American National Museum, www.janm.org. It was there that I first read the story of the remarkable Clara Breed, the children's librarian of San Diego, who is 1942 was heartsick that her young Japanese American friends were being treated as enemy suspects and robbed of their freedom and rights as citizens. When the young people were being moved out of San Diego, Clara went to the train station and gave them all stamped, self addressed postcards. She urged them to write so that she could send them books and anything else they might need. It was online that I began to read some of the 250 letters that they wrote to Clara. Their letters not only chronicle the incarceration, they reflect the sense of loyalty and hope these young Americans held onto despite the treatment they were given by their own country. I kept returning to those letters, night after night until I practically knew them by heart! As a writer, I recognized from the start that this was a story that had to be told and in the words of those who lived it. I wanted to know what had happened to these young people? Where were they now and how had the incarceration and Clara Breed changed their lives? A few weeks later I found my friend, Ellen Yukawa (at right), thanks to someone at the museum. It turned out that she had been in the same camp as Clara Breed's young friends. Again and again, there would be moments when coincidence, blind luck, or maybe fate carried me along in finding the people who could tell me the stories that enlarged upon the letters, stories about Clara and the young people who lived it. Clara Breed's story spoke to the idea that one person could make the difference in the lives of many people-including my own. Gathering the story of Clara Breed and her correspondents was to become my passion for the next four years. It sustained me through a bout with cancer, perhaps giving me the strength to see that people do survive ordeals. It resonated in ways that I could not image when 9/11 turned our world upside down. I believe it is a story that not only tells us about our past, it is a cautionary tale that has meaning to us today. 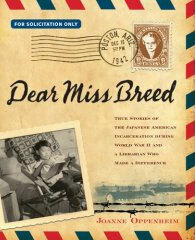 Q: In 1941 what do you think it was like for Miss Breed to be an outspoken woman for Japanese American rights? Clara Breed was not looking for fame or thanks for what she did. In fact, according to those who knew her, she would be embarrassed that anyone needed to talk about her efforts. Clara Breed was a woman of courage and strong convictions. She spoke out against the injustice of the incarceration- saying boldly that the only crime the Japanese Americans had committed was having the wrong ancestors. But these were no ordinary times. She lived in a city where she risked being despised as a "Jap lover" and even losing her job in the San Diego Public Library. But, Clara Breed held fast to her beliefs. As the child of a minister who had worked on Ellis Island at the turn of the century, Clara took to heart the struggles of immigrant Americans. Nor did she forget that during the Civil War her ancestors were abolitionists who fought the injustice of slavery. Clara Breed knew that she could not stop the incarceration, but that did not stop her from doing what she could do by speaking out on their behalf and sending them gifts of the heart that showed them they were not forgotten.